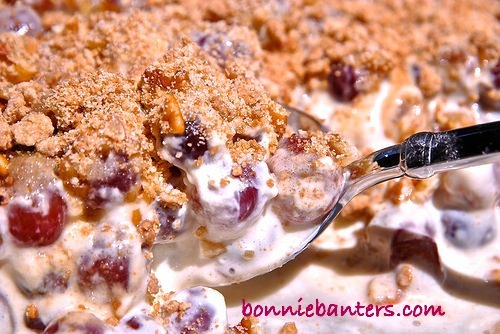 Bonnie Banters: Grapes In Cheesecake Cream with Toasted Pecans and Gingersnap Crumb Topping! Remove the grapes from the stems, run under cool water, drain and thoroughly dry with a clean dish towel. Set the grapes aside on the towel to continue drying. Toast the pecans lightly, tossing over medium heat in a small skillet, or toast gently in the microwave on high in 15 second intervals, stirring between intervals. Set aside to cool. Mix the dry ingredients and work in the butter with your fingers or a pastry cutter. Keep in large crumbles and don't mix too thoroughly. Spread the mixture onto a baking sheet lined with parchment paper and bake for approximately 12-15 minutes, or until golden brown. Carefully lift the parchment paper with the baked topping off the pan and transfer to another pan or cutting board to cool. Store in a covered container until ready to use. 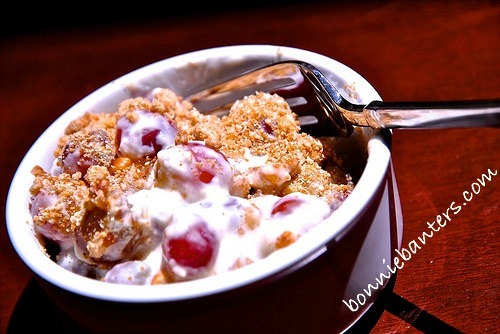 In a large bowl, using an electric mixer, mix well the cheese, sour cream, sugar and vanilla. Add the grapes and carefully combine. Gently incorporate the toasted pecans. Pour the mixture into a 9 x 13" baking dish and refrigerate until cold, at least an hour. Just before serving, sprinkle with the gingersnap crumb topping. Improves with flavor in a day or two and will keep well in the refrigerator for about a week. Now, I'm Gonna Have It For Dessert!